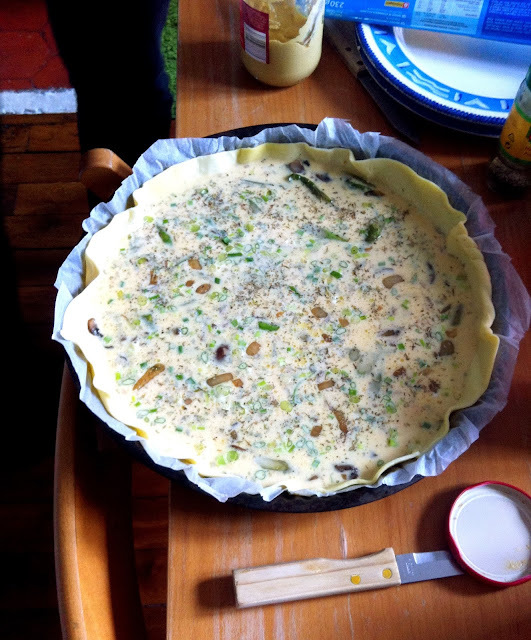 Before moving to France I had never made a quiche in my life. I had ordered them at cafés and polished them off quickly enough, but I had never actually imagined making them at home. Too hard I thought. Until, I came over here and I was eating in Frenchie homes with Frenchies. I've had more homemade quiches than non-homemade quiches now. John makes them all the time, so does his Mum. John also bakes things like this, putting me to shame with his cooking and baking. Oops. Oh well. When I visited a girlfriend in the 18th, she made one in her tiny oven. 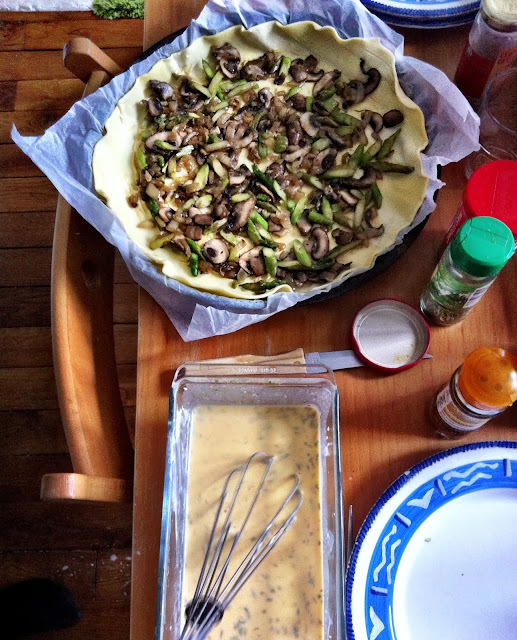 When I visited my cousin's cute studio in the 14th, she made a quiche in her microwave! It seems like Frenchies see their quiches the way I would see a ham/cheese/tomato toastie-toastie or a bowl of instant noodles (except you wouldn't necessarily invite someone over and serve a toastie-toastie, or instant noodles.. unless they were a really good friend). 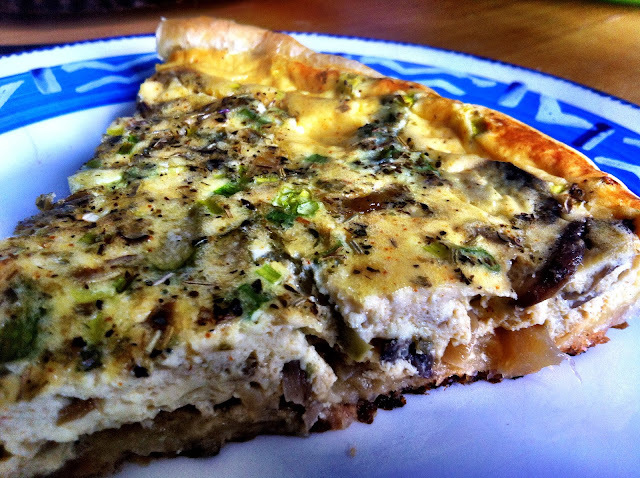 What I've also learnt about quiches is that the possibilities are endless! Quiche Lorraine is not your only option. You can put virtually any combination of veggies together and can't go wrong. 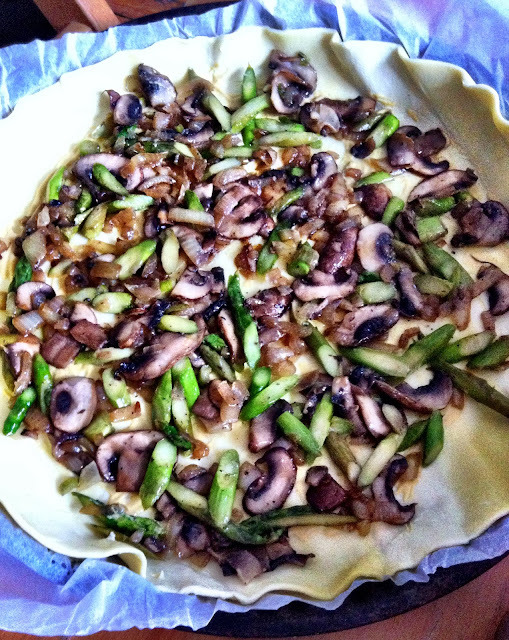 Today, I made an asparagus and mushroom quiche (sounds fancier hey?) 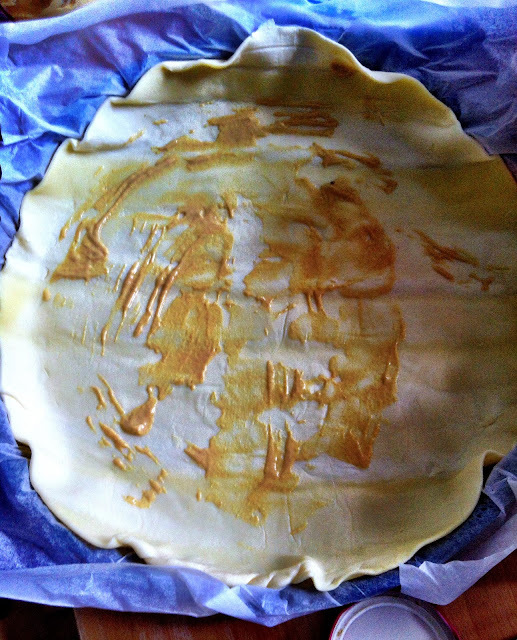 and it turned out pas mal du tout! First slice the asparagus diagonally and gently steam them, covering them over for 3-5 minutes after the water has started boiling. They should be tender but still firm and crisp. 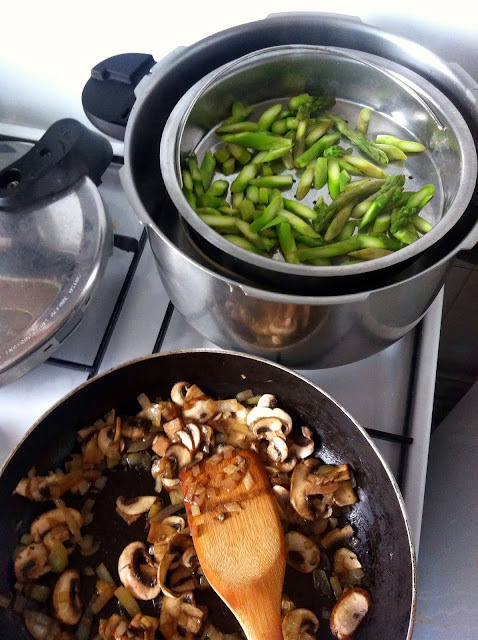 Sauté the chopped onions and the sliced mushrooms with a knob of salted butter on low heat until soft (you can replace the butter with olive oil if you like). 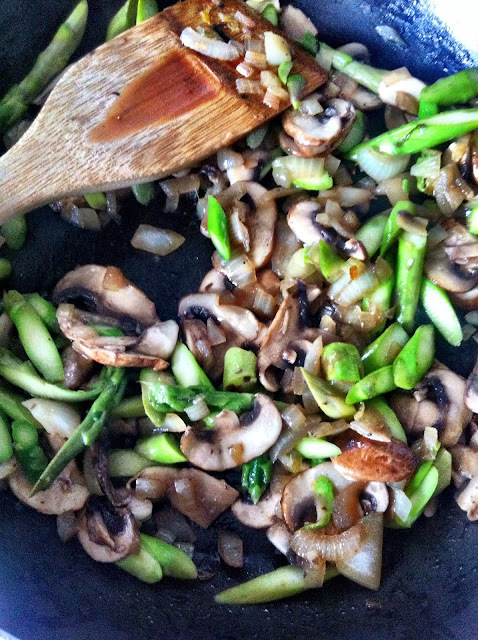 Combine the asparagus and mushrooms on low heat. Add some salt and pepper to bring out the flavours. In a mixing bowl, combine the 4 eggs, crème fraiche and milk, whisking away to aerate the mixture. Add whatever herbs you like (or that you can find). 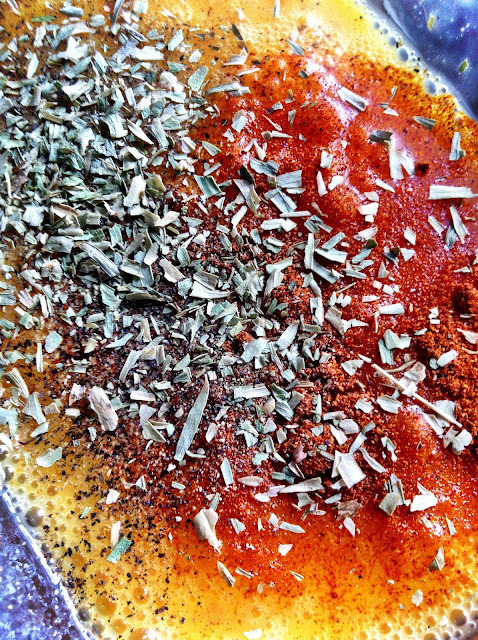 John likes to add a bit of paprika so we threw that in along with the tarragon, herbes de Provence, salt and pepper. 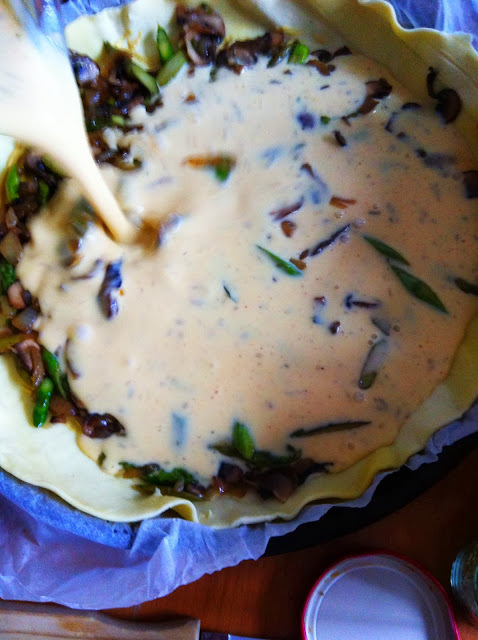 Pour out the filling first to ensure even distribution of veggies. Pour over the egg mixture to cover filling completely. Add finely chopped spring onions/chives on top, depending on how much you'd like. Pop it into the oven at about 180 degrees for 30 minutes or so, or until a knife inserted towards the centre comes out clean. BON AP' - serve with whatever salad you like. Easy meal ready in under an hour that will taste better and cost less than something that is reheated in a café. Trust me, you'll notice it in the quality and taste of the flaky, crispy puff pastry that's just come out of the oven. Not to mention that your home will smell of piping hot oven baked puff pastry...yum. Or should I say "miam"? - nah, YUMM sounds better. Yum yum!! Thank for the marvellous posting! Seriously enjoyed reading it. 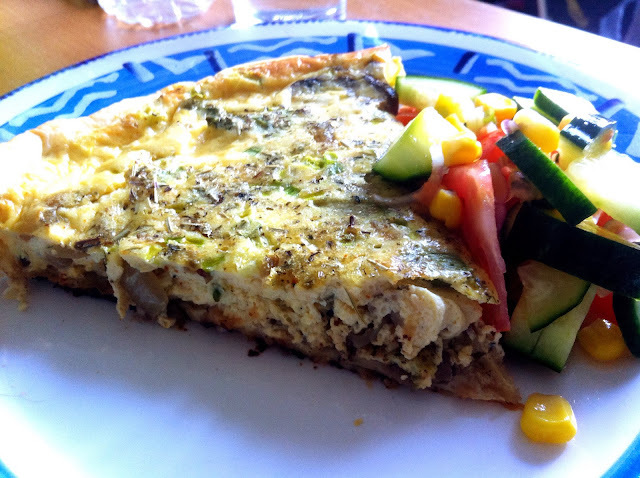 I will add some seafood in your ingredients to make my favourite seafood quiche=) yummy!!! !